Background: The Overhex brand, Survivor, was named after a Nguni cow who accidentally found her way to a farm situated in the Swartland area, by jumping truck as she passed by. She miraculously survived her injuries and today the Survivor wines pay tribute to this amazing cow, as well as the unique terroir of the Swartland, where the grapes are sourced from. 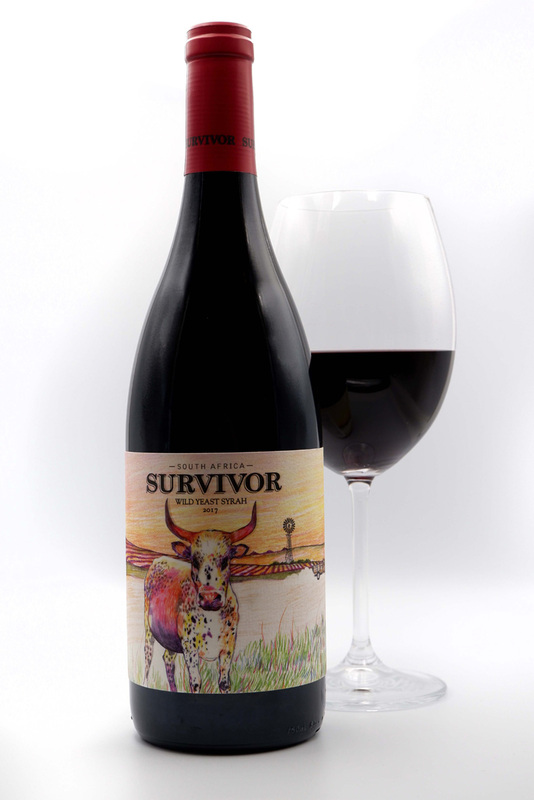 The Survivor range comprises of nine wines, including two Wild Yeast versions: the Chardonnay and the recently released Syrah 2017. The grapes for this 100% Shiraz were hand harvested in the early hours of the morning. 30% of the grapes (whole bunch) along with 70% crushed grapes were placed in 500 litre barrels. Natural fermentation commenced after which the wine was given a further extension of 60 days on the skins during which time malolactic fermentation (the conversion of malic acid into lactic acid) 1occurred. The wine was then separated from the skins and further matured for 12 months in third fill barrels. “Mind, body and soul – this is how wine is really made without the use of commercial yeasts so that we can experience the true taste of terroir,” says winemaker Ben Snyman about this uninhibited expression of Syrah. Result: The wine is full-bodied with spicy pepper and red cherry aromas, with silky rich flavours of spicy blackcurrant fruit with supple tannins and hints of sweet oak on the finish. Drink with what: Winemaker, Ben Snyman says he enjoys the wine most with spicy stir-fry pork, leg of lamb or chicken and spare ribs on the braai. Can’t argue with that!